If you’re a climber in the Chattanooga area, you’ve surely heard the name, Lisa Rands. 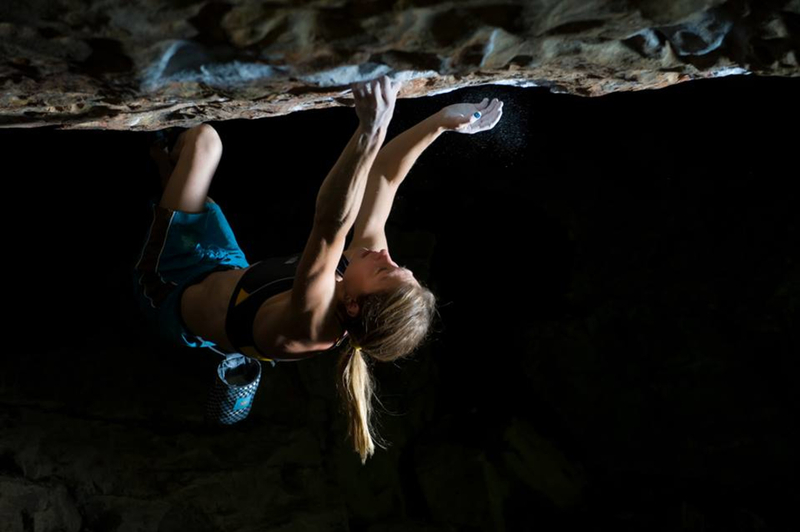 And if you’ve been lucky enough to see her at the bouldering field or at the gym, you know, not only how strong of a climber she is, but also just how much she lives and breathes the sport. Here, we sat down with Lisa to discuss why she thinks the Stone Fort leg of the Triple Crown is such a special event. Since you’re more than familiar with Stone Fort, can you describe what climbers see and experience when they arrive? Visualize a playground of grey sandstone boulders and short cliffs tucked against a forested hillside on the edge of an immaculately manicured golf course. Leaves of gold, yellow, red, and my favorite orange, spiral through the air from the soaring deciduous trees. The once-frosted grass on the fairway turns a brilliant green under the blue sky as the sun rises with my mood. Pinch me! This must be a dream! Everyone gathers on the grass—hundreds of excited climbers create a buzz of positive energy that travels into the boulderfield, where the climbers work together—sharing beta, spotting, and encouraging each other. I’m reminded of the time I saw a swarm of African Bees rise out of a canyon and fly as one large entity toward their next nest location. Thousands of wings all beating in unison with a hum so powerful I could feel the vibration through my entire body. You won Triple Crown last year. Can you tell us how you prepared for the event? I focused on honing my ability to keep climbing when tired, and building calluses on my fingertips as defense against the punishing rock and the unavoidable slips and falls. Absolutely you would train differently according to what your goals were. 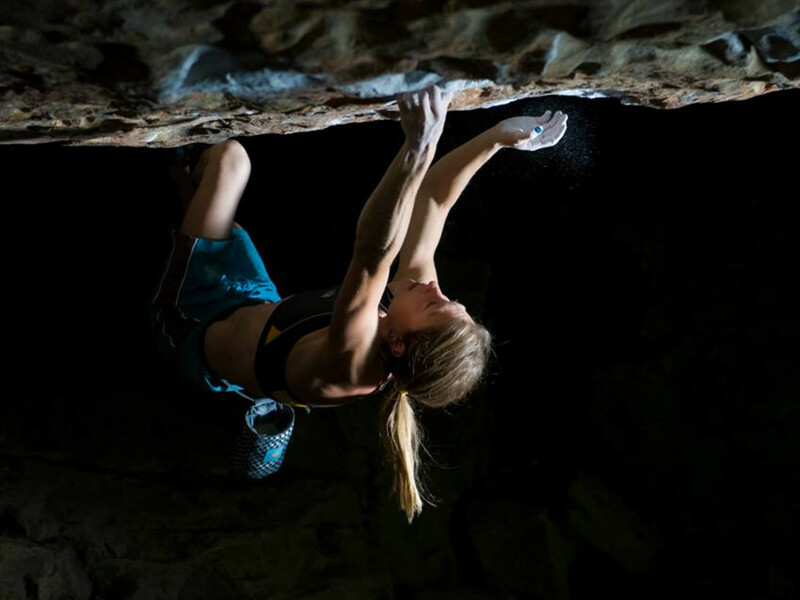 For a bouldering competition like the Triple Crown, climbers need to focus their energy on bouldering outdoors as much as possible, and ideally at the climbing areas where each event takes place! Sounds like cheating? Well, that’s how it works! Is there anything special climbers have to do for shorter bouldering problems versus long traditional or sport climbing routes? Don’t aim too high. Make sure your base level is good. If, like me, you can’t do as much as you’d like outside, you can train indoors with a specific routine intended to improve your ability to climb hard boulders when tired. You also need to work on climbs that simulate the kind of moves required on outdoor boulder problems. What makes an event like Triple Crown so great? There are too many things to list, but here’s one example: the camaraderie and shared passion are why I love rock climbing and Triple Crown so much! An amazing thing happened to me last year—I was ready for my 10th climb and undecided about what to do. A competitor next to me suggested a climb I was unfamiliar with. He then walked me to the climb and suggested a sequence that enabled me to quickly complete the climb which I had never done before. After everyone is done with their 10 climbs, how does the day wrap up? As the score cards are turned in at the end of the day, exhausted climbers flop down on their bouldering pads to share battle stories and compare their battered, bruised, and bloody fingertips—all signs of a true competitor. The music cranks up. Food is eaten, and drink starts flowing. Score cards are tallied while raffle prizes are won. The night ends with podium finishes and prizes handed out by the dozen. Everyone has a chance to win something from the Beginner category to Open, from the Star-Chaser to the Masters event. What makes climbing or competing especially so close to where you live special to you? I’ve traveled internationally for climbing and for climbing competitions and it has been the most beneficial and influential force on my personality. I have seen how different cultures live around the world. I have also seen a lot of hardship and people struggling to survive. I feel I am a lot more appreciative of things I have, things that I might take for granted had I not traveled to other countries. We are so lucky and have so much right here. Are there other sports you enjoy? How do they benefit your climbing? I used to really enjoy trail running and hiking in the mountains near Bishop, California where my husband Wills Young and I lived before. Since we moved to Chattanooga, I miss that a lot; I still walk around the city, or around my local trails of Stringers Ridge. I also try to walk/run from home to work and back as often as possible, and also do a bit of biking around on my beach cruiser. Staying fit is crucial to maintaining shape for climbing and these extra activities provide some cardio while helping me clear my mind and relax. That said, I do all my serious training through different climbing drills.